We are starting yet another new Blogging Marathon Edition, BM#54. for week 1 I will be continuing my Fruits all form for Kids. I know I have repeated myself quite, yet I need to say that cooking with fruits is a challenge for me. I could hardly come up with ideas. I was again and again coming back to the same old Banana cakes. I know I have few versions already on the blogs. And coming up with another version seem too boring. Yet I have a valid reason. Since I am thinking on lines to have good snacks that can be packed and still stay good over 8 hours for Konda, I wanted to select healthy options and especially tea cakes. I love the concept of Tea cakes, and would prefer it to be mildly sweet and crumbly. I have always loved the Britannia Tea Cake slices but have never tasted it as it doesn’t come eggless. However I have touched the texture and wanted to replicate the same. In the cake today, or as I prefer to say loaf, I have used wheat flour, honey and brown sugar. The cake turns out superb with mild sweetness, the banana flavour is more prominent, yet not too much. When it comes to selecting flours or selecting sugars, I do not actually preach anything. How you eat your cake or what healthy options you want, is your personal choice. However I use All purpose flour very regularly along with refined sugar as well. So as another alternate, I look out for bakes that turns out good with wheat flour/atta and other sweetness. In those terms, thos loaf is awseome. 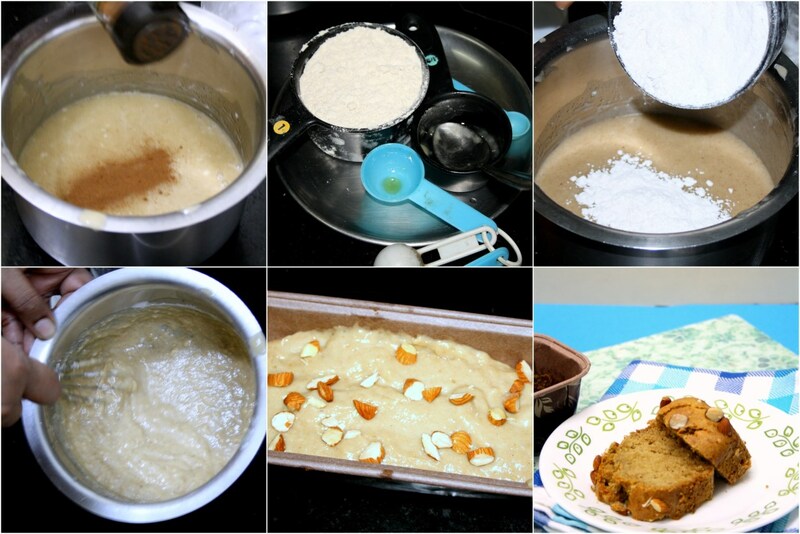 I adapted this recipe from Usha, who was inspired by Pavani, who was inspired by KAF cookbook. So you know this has come a long way. The best part of this cake was that, everybody at home were so much taken in by the taste, texture and everything about it. Trust me, since then, if an overripe banana is seen on the table, all of them have started suggesting that I bake this cake for them! Ground Nutmeg – 1/8 tsp. Pre Heat the oven at 175 C.
In a bowl beat oil, sugar, cinnamon powder, nutmeg powder until smooth. 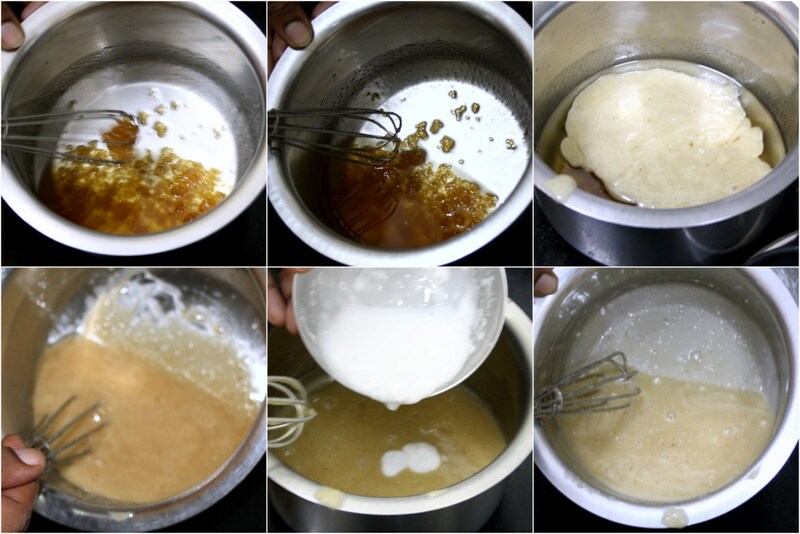 Add mashed banana, honey and egg replacer to oil mixture, and beat until smooth. Fold in the flour and finally add the baking soda and little milk if required to get the dropping consistency. Transfer to the baking loaf, top it with chopped almonds and bake at 175 C for 30 – 35 mins. Test for done-ness and let it cool before slicing. Since wheat flour is used, do not beat it too much. Also adding Soda at the end will ensure your air pockets are safe. Baking at 175C for 30 mins will ensure your batter has enough time to get cooked well. You could use chocolate chips and fold it into the batter as well. Whole wheat is definitely better than APF but tricky to work with . You have mastered the art and got a super texture. The loaf looks nice and spongy . 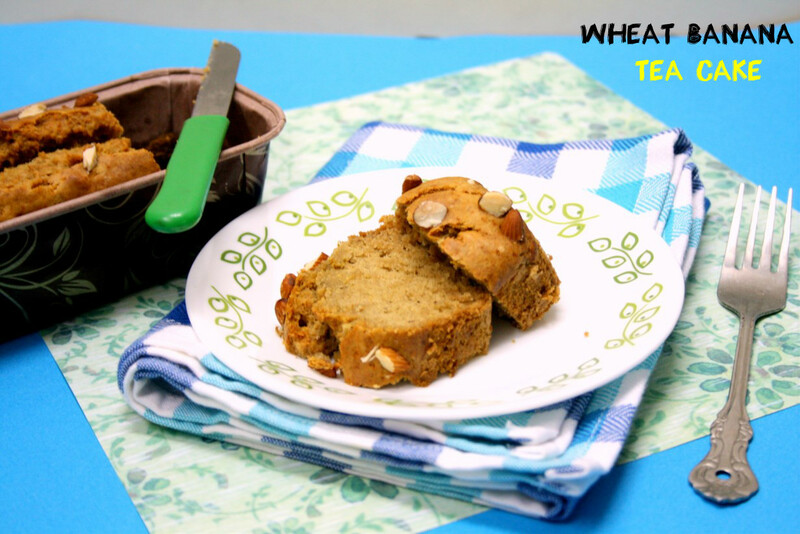 I too love banana bread,but never tried it with wheat flour, it looks awesome and i like the crack in the baked bread. 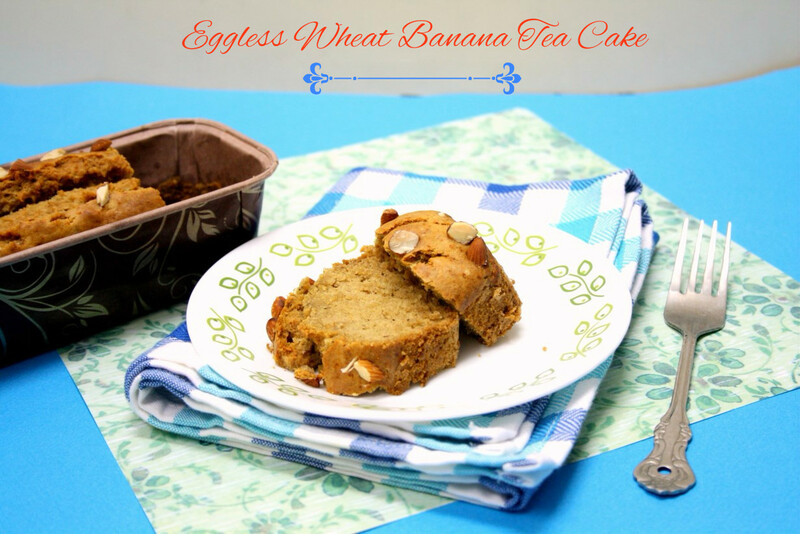 We love all varieties of banana bakes at home and I am sure this one was delicious too. 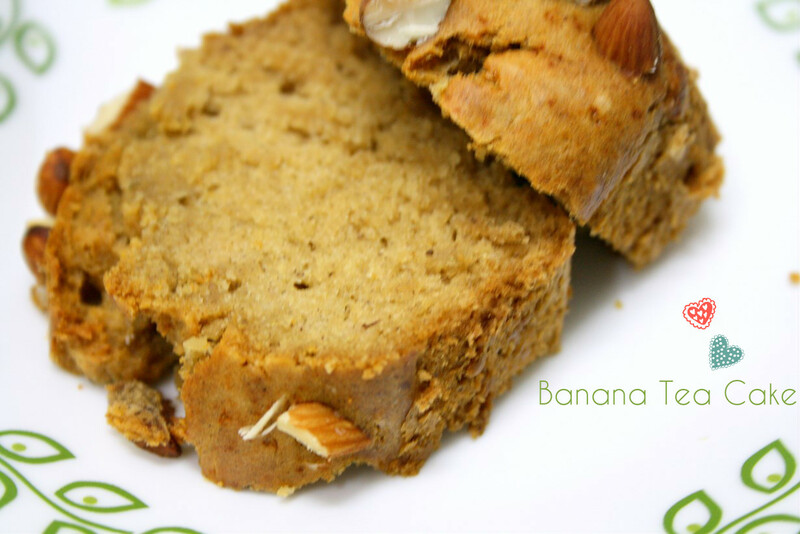 WHole wheat flour works really well with bananas. You dont feel that its too dense in this cake.. This whole wheat banana muffins are our family favorite. Your post reminds that it's been a while I made these 🙂 Tea loaf came out just perfect. 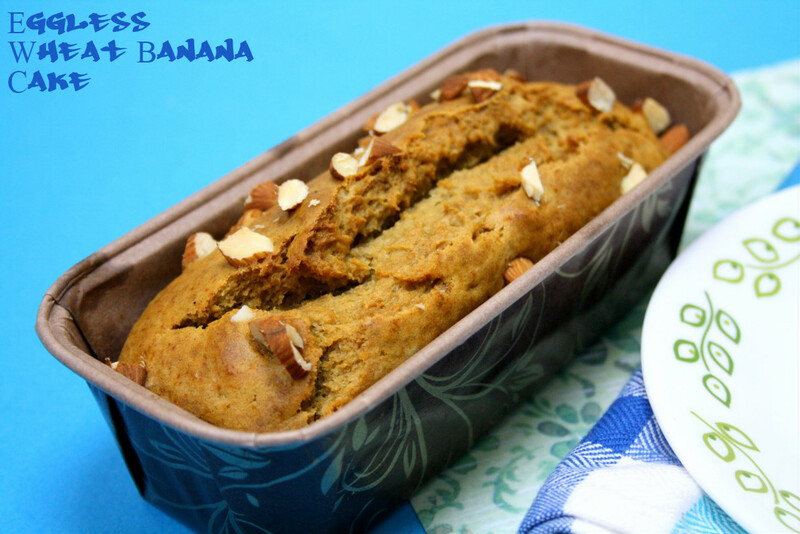 lovely banana cake..love the use of brown sugar in it..
Love this heealthy banana cake, a prefect pair to enjoy with a cup of tea.. I baked a different variation of this bread at my cousin's place and their kids loved it. I shall bookmark this version as well.